Copying books, poems or lyrics to share with children at your facility? There is now one annual licence to cover you to use these copyright materials – Early Childhood Australia has partnered with Australasian Performing Right Association Ltd and the Australasian Mechanical Copyright Owners Society Ltd (APRA AMCOS), Australian Recording Industry Association (ARIA), Phonographic Performance Company of Australia (PPCA), Copyright Agency and Viscopy to make compliance with copyright law easier and more affordable. Fees are based on how many children you have licensed for your premises. $3.14 per licensed place, per year (for ECA members). 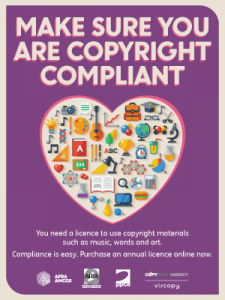 To ensure you are compliant with copyright law at early educational services there is now one simple annual licence to cover creative copyright materials. Early Childhood Australia (ECA) is currently selling an easy to purchase, bundled and more affordable early childhood sector exclusive copyright licence. Does your service play CDs or iPod music to groups of children? For example during naptime or dancing and singing activities? Does your service play a movie or a music DVD? Especially when it rains and you can’t go outside to play? Do you copy books, poems or song lyrics to share with children? It is not only best practice but a compliance issue to ensure you are copyright covered for all the support materials you use. APRA AMCOS, ARIA, PPCA, Copyright Agency and Viscopy have bundled their requirements together for ECA to offer you ONE, simple, annual copyright licence for use of books, music, poems and illustrations at your facility. Fees are based on how many children you have licensed for your premises and are payable just once a year. Why not become an Early Childhood Australia Member and obtain a further reduced rate for your copyright licence? Copyright compliance is essential. Showcase that you care about today’s creators and the creators of tomorrow. You will also receive a free ‘we care about creators’ sticker on payment. Download our guides on the Early Childhood Education Copyright Licence below.